This new Rover® RB-115G combines all the best features of two popular instruments for the player who wants something new and different! 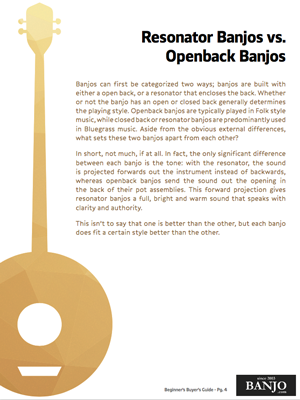 Any guitarist can instantly get that distinctive banjo sound without having to learn any new technique. The comfortable, well-contoured 6-string neck plays just like a regular guitar but the player has easier access to the highest positions as the player’s left hand can easily reach up to the 22nd fret! The tone is big and full with a standard 11″ diameter pot with attached resonator. This guitar-banjo will definitely allow your music to be heard! The sealed chrome-plated tuning machines tune smoothly and accurately and the Mahogany neck has an adjustable truss rod to ensure perfect alignment at all times. The new RB-115G is a novel instrument with unlimited possibilities!